Dealing with hazardous materials is, as the name suggests, hazardous. Explosives, gases, and other dangerous substances aren’t easy to handle—it’s a tricky business. When mismanaged, these materials can compromise workers’ safety and security; employees may be exposed to explosions, fires, spills, and other life-threatening situations. In addition to these dangers, hazardous material mismanagement which has its own penalties under the law. It’s the responsibility of business owners and employees to safely handle and dispose of hazardous materials. 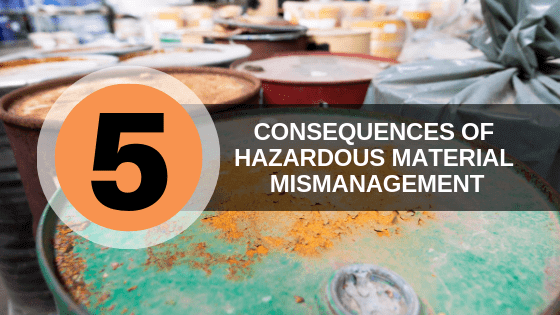 Therefore, we’ve put together a brief guide to help you manage your HazMat program properly and recognize the severe consequences that come with mishandling hazardous materials. We’ve identified five areas that you’ll need to consider. Every relevant employee should have a specific role in your company’s hazardous material management program. There should be a training coordinator, as well as workers who specifically handle, transport, and dispose of the hazardous waste. If organizations report issues related to your company, your employees will need to perform more work to try and alleviate these problems. They may have to double up on responsibilities to fill in any gaps in your company’s structure. Companies are obligated to consider the environmental effects from a hazardous substance release; toxic waste harms animals, humans, and the environment every day. Although there are regulations for hazardous materials, contamination still happens. Because of the toxins in the air and water, contamination and pollution are linked to respiratory conditions such as asthma, as well as other diseases. The human body can only tolerate certain amounts of chemicals, so you don’t want to put others at risk of long-term harm. Additionally, environmental damage, disrupts animals’ health, reproduction, and population levels. Therefore, to avoid contributing to environmental disasters, do your part to inform your workers about environmentally-friendly practices. Let them know that they must dispose hazardous materials in designated facilities. Failing to do so hurts your company’s reputation, as you become a threat to the people and wildlife in your local community. National organizations, such as the DOT, EPA, and OSHA, work hard to respond to chemical and toxic substance exposure, thereby protecting our communities from hazardous substances. It’s no secret that when your workers mismanage hazardous materials, your company may fail the regulators’ required inspections. And when you fail these inspections, you don’t comply with state and federal guidelines, which has material consequences and hurts your company’s name. If you don’t follow various acts, such as the Clean Air Act and the Clean Water Act, your failed inspections may even lead to a facility shutdown. Additionally, laws will change over time, so be sure to stay on top of them and relay any updates to your employees. Whether it’s improperly storing hazardous materials or foregoing a step or two related to personal cleanliness after handling unsafe substances, there are shortcuts that may tempt your employees to put their safety on the line. A solid training program provides workers with information about procedures that will reduce the likelihood of dangerous accidents. For example, in the event that workers do manage materials incorrectly, they need to know how to manage the spills on their bodies or care for the chemical splashes in their eyes. When employees don’t take every precaution to protect themselves, they put themselves at risk for injury. Unfortunately, they may even put themselves at risk for death. Even if employees receive the proper training, an accident can still occur at any time. Your workers need to make fast decisions and handle them appropriately. When it comes to potentially dangerous materials, employees must be proactive and take extra care while they handle them. If you violate disposal laws and fail inspections, you’ll receive large civil penalties. In fact, while these fines vary depending on the state in which your company operates, they can come to tens of thousands of dollars, as the penalty rates have increased over the years. For example, in 2018, DOT and EPA fines increased and RCRA violation civil penalty costs more than doubled! One violation could do serious damage to your company. Plus, there are other long-term expenses related to your violations. If workers injure themselves, you’ll need to take care of worker’s compensation costs, and your insurance premiums will increase. To prevent financial penalties, you should have hazardous materials protocols and training programs in place. Employees need a plan that they can follow in order to handle materials in ways that comply with state and federal regulations. Setting an effective program in motion now will help you avoid expenses down the road. To prevent hazardous material mismanagement consequences, the Hazardous Materials Regulations (HMR) require your employees to be certified and receive ongoing training (once every three years). Besides being human beings who you don’t want to harm, your workers are also valuable to your operations, so it’s in your company’s best interests to keep them protected. Your success depends on them and their safe practices, and we’re committed to helping you and your employees succeed. HazMat School provides interactive online training courses for drivers, supervisors, shippers, and other workers who must meet DOT, EPA, and OSHA requirements. The courses are available 24/7, so your employees can complete them when it’s most convenient. They can also ask our Remote Instructors™ any specific questions you may have at any time. Plus, to earn their certificates, they won’t have to worry about the commute—they can simply take the course on their preferred device. Our courses teach over 20,000 students each year to recognize the dangers behind hazardous materials and to understand their potential for causing accidents. They also learn how to effectively handle and transport hazardous substances. For a high-quality learning experience, review our course list and enroll with HazMat School today.